1. His openness to Truth, wherever this is found. When he began using the thought of the ancient Greeks, especially Aristotle, many were not only skeptical of his enterprise, but were downright antagonistic, believing that something as “impure” and “profane” as these ancient philosophers should never be given a place at the table of Christianity. But Thomas did. And history and a once-incredulous church eventually judged him right. Unlike other thought-systems that insist on an irreconcilable difference, and a dichotomy and separation between faith and ordinary life, between the sacred and the secular, between the church and the world, Thomas shows us a way that sees the transcendent-in-the-immanent, God-in-our-midst, a world that as St. Paul says, “lives, and moves, and has its being” in God. 2. The ‘balance’ and ‘moderation’ of his thought. Thomas steered clear of extremes, in whatever shape or form. In this his thought mirrors the best of Catholicism which, at its finest, abhors anything that destroys the delicate balance and symmetry of faith and life. Thomas’ thought always sought the “middle ground”, the “judicious mean” between extremes, whether this has to do with our understanding of ourselves, of the world in which we live, or God himself. Anyone who truly understands and appreciates the thought of Thomas cannot possibly become an extremist or fanatic, not in things that have to do with life, or faith, or the church. It wasn’t only Truth that for Thomas, stood squarely “in the middle”, rather it was Christ himself that was to be found there in media res, living, present, always at work. 3. The immensity of his faith and trust in the God whom he loved. By faith, I do not mean simply, faith as profession, but faith as trust and confidence in the guidance of the God whom he sought to know and love throughout his life. Nothing could shake Thomas’ confidence in the goodness of this God; and this allowed him to sustain and nourish his intellectual curiosity. Thomas is a giant; most of us, out of fear of the unknown, would rather shrink into the safety of our shells and cocoons instead of “going out in the deep”, full of faith and trust in a God who has promised to be with us no matter what. 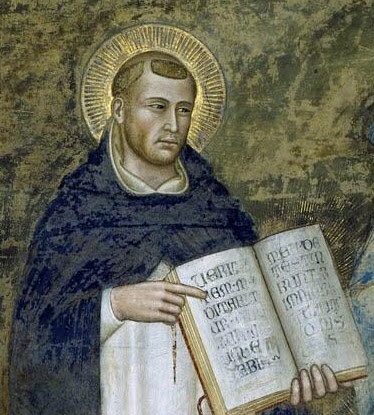 Thomas’ was a faith that saw no boundaries to the presence and activity of God in his creation which, despite its faults, flaws, and failings, remained at its very heart, good. This is especially shown in Thomas’ love for the Eucharist which, in Catholicism, is the highest expression of the goodness of God’s creation: ordinary bread and wine, the work of human hands, yet able to become the very body and blood of his Son. To see the world as capable of being a “sacramental” presence becomes possible only when one trusts that nothing is beyond God’s reach. 4. The all-embracing character of his thought, the catholicity of his spirit. Thomas represents the best of who and what we stand for as Catholics. To be catholic is to be κατα ολον (kata-holon), to live “according to the whole”. And yet the breadth, scope, and vastness of Thomas’ philosophical and theological enterprise is but one embodiment of this all-embracing character. Thomas’ spirit was like an empty vessel, ready and waiting to be filled with anything and everything that God placed in it. The antithesis of this can only be fear which can cause one to close himself up to the tremendous possibilities all around him. Thomas looked into all things, considered all things, grappled with all things. The soul after all, as he said is “quodammodo omnia”, a dynamic openness and capacity to receive all things. If we are in fact, the creations of a God who is Transcendence himself, then the seed, the spark of the transcendent is in us. We are like vessels that God can fill with anything and everything, because that is what he has made us to be. It was Augustine who once said: “You have made us for yourself, O God, and our hearts are restless until they rest in you”. Yet this openness was not an openness for its own sake. It had an orientation, a direction, a purpose and a goal: to seek the Truth (about oneself, one’s world, and God) by following it wherever it leads. 5. The greatness of his faith that yet remained simple, like that of a child. And this perhaps is what has given the ultimate orientation and directedness to Thomas’ thirst for Truth. No matter how deep the recesses of human existence he managed to plumb, no matter how great his discoveries about human life and existence, he knew that there was something more, in some other realm which “no eye has seen, nor ear heard” that God has in store for one who remains faithful to the quest, to the very end. Ultimately, no matter where our journey and search take us, no matter where our wandering mind, heart and soul lead us, no matter how high or low our thoughts might bring us, like one with “the heart of a child”, we know where our true home is, and it isn’t here. Thomas knew that. He loved the world so much that he sought to find God in its every nook and cranny, yet this very same love enabled him to realize that it was not an end, but a marker along the way, a pointer to something that far exceeded anything that this world allowed him to imagine. To truly understand Thomas is to understand the words of Jesus in scripture: "Unless you acquire the heart of a child, you cannot enter the Kingdom of God". At the heart of a child is wonder, amazement, and a boundless enthusiasm and anticipation for whatever God has in store for us. As we celebrate his Feast, we who are heirs to his faith, his passion, and his commitment, may Thomas’ thirst for truth, and his sense of the great adventure of human existence, be ours as well.